Oh, how the story of Curt Schilling’s bloody sock will forever morph as time moves ahead. Certainly, at some point, aliens will be involved in making the sock red. McGILLIGAN:Time does a lot of funny things to one’s memory. It can distort facts and happenings of actual events into reasonable facsimiles that we come to accept as truths. This happens in sports all the time. Stories get exaggerated or blown out of proportion. However, some stories are simply made infinitely better because of the distortions of time. So here’s a smattering of sporting events and how I believe I will come to remember them in 20 years. The infamous ‘Bloody Sock’ game. 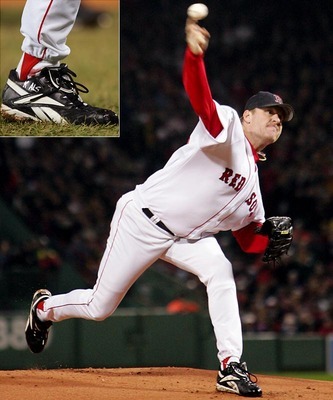 Starting pitcher Curt Schilling, who did not look good in Game 1 of the ALCS, pitched a great game despite having an ankle injury that resulted in some bleeding that led to his white sock turning red. What time will do: I will tell my children that Schilling came out with a ridiculously pronounced limp, fanned 14 Yankees and the bleeding was so bad it had to be soaked up between innings by the grounds crew. Canada wins the gold medal by defeating the USA in the final 5-2. Earlier in the tournament, the usually mild-mannered Wayne Gretzky – Team Manager of the Canadian squad – went on a bit of a tirade about Canadian hockey which focused most of the attention on him and took a lot of the pressure off the players. What time will do: Sitting in a rocking chair on the porch of my home, I will wistfully tell my grandchildren the story of how Gretzky came to be called the Great One. Trailing 2-1 to start the final period, Gretzky decided to come out of retirement. The Great One scored four third period goals – all end-to-end rushes if I remember it correctly – to help Canada wins its first gold medal in 50 years (no need to embellish the last part). Joe Carter blasts a three-run home run to propel the Toronto Blue Jays to its second World Series title defeating the Philadelphia Phillies. I can still remember jumping up and down in my living room when this happened (I’m a Red Sox fan, but as a Canadian I loved that team). What time will do: Just moments after being sworn in as a Canadian citizen in the dugout, Carter stepped to the plate and hit the winning home run which smashed through one of the SkyDome’s restaurant windows. The ball landed directly in a plate of fries, how do I know this? It was my plate of fries. After sawing off the bat of Mets catcher Mike Piazza, Yankees pitcher Roger Clemens throws part of the broken bat at Piazza while he runs to first base. Clemens tries to claim he thought the piece of jagged lumber he threw was a ball. What time will do: Probably nothing, some people do such stupid things (like claim to have never used steroids and used the word misremembers) that no embellishment is needed.